This week-end’s Gold Coast Bulletin (Sat 26th April 2014) ran a great piece on the anthology. The article was written by Barbara Dyer and featured stories Three Wishes by David Stringer, War Bride by Kay Gibbs and Jumpinpin by Thoraiya Dyer (no relation). You’ll find the article on page 33. Make sure you buy a copy. 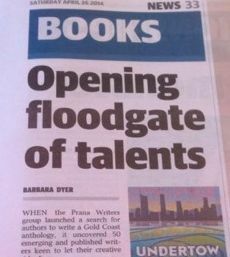 ‘Opening floodgate of talents’ is an excellent headline – and that’s really how the whole process of the anthology has felt. Not only has it drawn on the great talents of writers through the stories, but we have discovered great talents within Prana Writers in putting the publication together, and drawn on many great talents of those supporting us through the process. In all, a flood of talents. Thank-you to all, and special thank-you to Nicola Tierney for organising the press release, and Barbara Dyer for putting it together. Congratulations it is always wonderful to have your talents appreciated. I’ll have to buy a copy. Thanks Jocelyn – you are a part of it too! …yep Janis, my heartest congrats to you and your fellow authors. Great write up, and congrats to Nicola also – it’s always a challenge to get print space. Congratulations on the success of your Anthology – special thanks to Margaret and all the talented writers that worked so hard to bring this work to print. Prana Writers have a right to be proud of putting this great anthology together. I am looking forward to reading it and of the many more literary pieces to come in the future. Thank you for your thoughtful comment, Kathleen. We certainly put our hearts into this project!